As many of you are aware we are moving over the next few weeks & I have packed up about half of my studio. I received a lovely big brown box from Stampin' Up! this week & got straight to work creating a few masculine cards for an upcoming event. I was just having a bit of a play with the Adventure Bound paper stack & I must say this paper is pretty good. I wasn't a big fan of it when I first saw the catalogue, but have seen some great uses for it lately. So, I ordered a few packs & the Guy Greetings stamp set & got busy. You can buy this paper as a bundle with the Adventure Awaits stamp set & save 15%! Here is one of my creations, quite simple but uses the Adventure Bound stack for most elements. It is a quick & easy card for that man in your life. 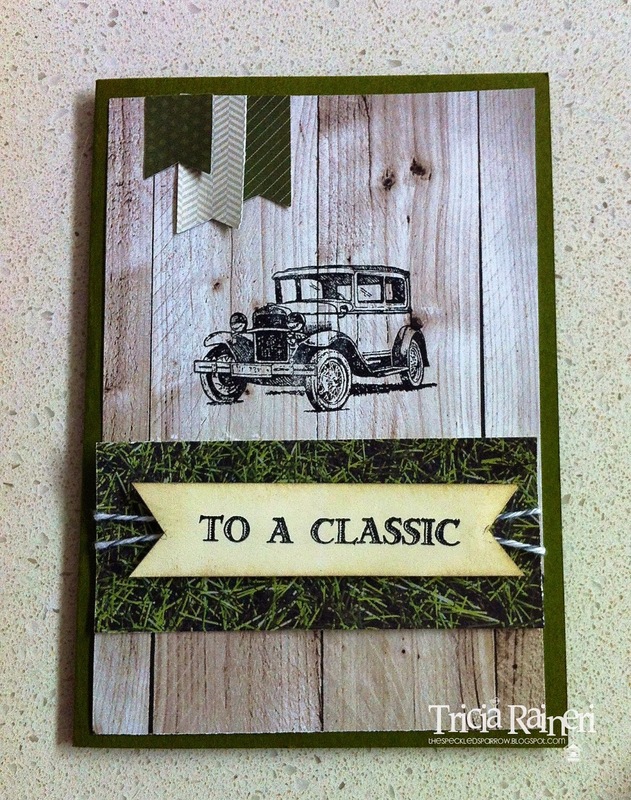 I can see lots of uses for that car & can't wait to try a few more Masculine cards once I am all moved & unpacked.